FIXYOURTHINKING.COM / Need a brain? Borrow mine! 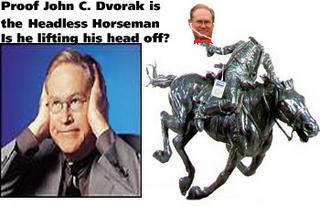 : The Headless Horseman Rides Again & "The No Mac Site Dvorak Pact"
The Headless Horseman Rides Again & "The No Mac Site Dvorak Pact"
Several emails have begged the question: "Why didn't I cover the "Mac Biased Media" article John C. Dvorak published last week? Readers, this guy is a moron. He is an unintelligible and incoherent writer. He also writes stories, on occasion, just to drive hits to his website - knowing he can always do so by angering Mac users. Therefore, I will report this story by providing you with the best story coverage I found; from MacSlash. This is too rich. John Dvorak, that paragon of journalistic integrity, is crying foul on pro-Apple reporting in the mainstream press. My favourite line: "This reality is not going to change. In fact it will only get worse as technology coverage is handed to newer, less-qualified observers who simply cannot use a Microsoft Windows computer." Aside from the starry look I get at the prospect of an entire profession breaking the shackles of a lousy computing platform, let's examine the source. His own bias against the Mac is well documented, so it's kind of funny to hear him complain that nobody else agrees with him. In my mind, the mainstream media isn't making nearly a big enough deal about the problems with Microsoft. After all, not only is the company a convicted -- and scott-free -- monopolist, but their software platform is increasingly expensive to use and raddled with security holes. What kind of Mac-obsessed, overwhelmingly biased media would let that story go? Ironically, last Halloween; I reported on Mr. Dvorak with the story: The Headless Horseman's Identity Revealed. This gives more credance to my theory - he surfaces with particularly bad stories right around Halloween. I will be mailing all of Mac News outlets over the course of the week - asking them to ban stories from John C. Dvorak and to discuss nary a word of him ... ever again. Any good points (which are few and far between) that Mr. Dvorak has ever made are borrowed from his own Google search talent and BLOG / comment forum theft. I will also bring a petition to petitiononline.com to ask for signatures of those who commit to not reading anymore of Dvorak's silly diatribe.